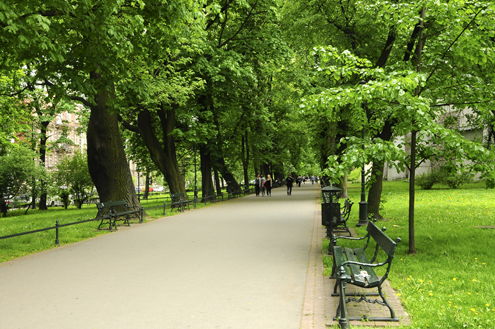 Surrounding the Old Town is the Planty—one of Krakow’s nicest features (or at least we think so). The Planty is a ring of public parks (or green belt) where the medieval protective walls and moat once stood. It’s a pleasant place to take a stroll or people-watch when you have a bit of downtime on your itinerary. The majority of Krakow’s sights are located in the Old Town historical district, except for Wawel Hill which is just south of here. 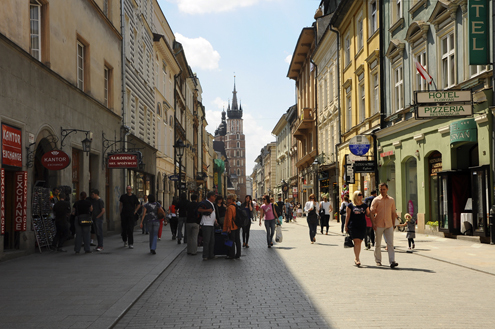 Main Market Square (Rynek Glowny) is the city’s center and main tourist hub offering many dining and shopping options. This massive square is one of the largest medieval squares in Europe. 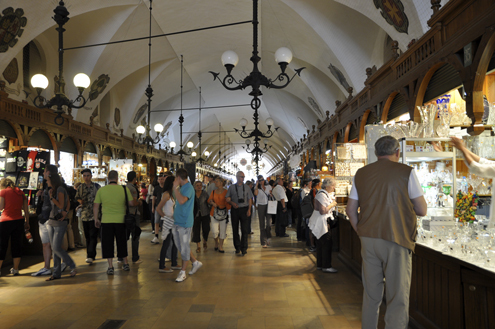 The Cloth Hall (Sukiennice) takes center stage in Main Market Square. 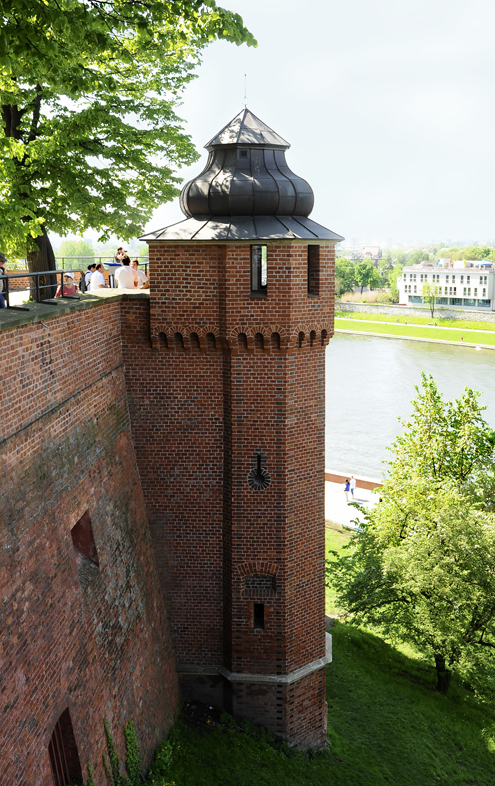 This structure dates back to the mid-14th century when Kraków was an important international trading post. The name Cloth Hall comes from the trading of textiles, but many other commodities were bought and sold here as well. The beautiful St. Mary’s Basilica (Bazylika Mariacki), in the northeastern corner of Main Market Square, is yet another amazing European church. Its main draw is the 42-foot-wide and 36-foot-high sculptured altarpiece of scenes from the life of the Virgin Mary by Veit Stoss. It is a magnificent work of art. One interesting tradition that takes place at St. Mary’s is the hejnal, or half-a-tune bugle call, played every hour from the Basilica’s left tower. The most common medieval legend states that during an enemy attack the watchman only got half-way through the warning song before an arrow pierced his throat…hence the half-tune played today. 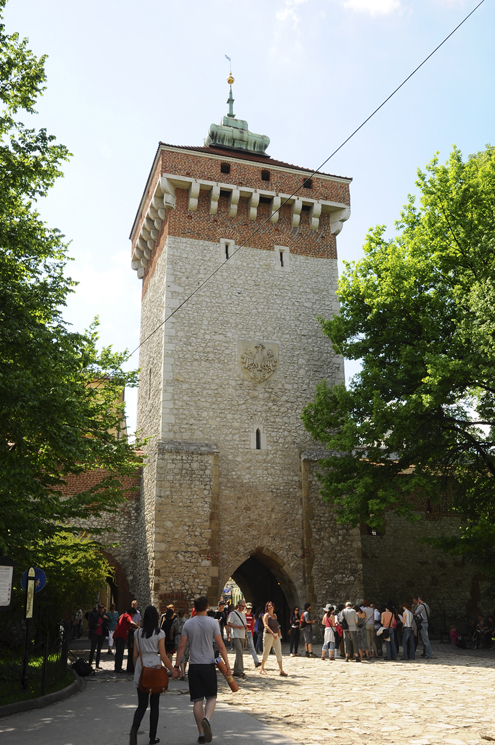 Floriańska Gate—One of the few surviving parts of the city’s old fortifications. When this particular McDonald’s was built, a Gothic cellar was discovered and now serves as additional seating for this fine eatery. Just south of Old Town is Wawel Hill (pronounced Vah-vehl). This historic area, including Wawel Castle and Wawel Cathedral, is an important symbol for all of Poland. The Wawel Cathedral (Cathedral Basilica of Sts. Stanislaus and Wenceslaus) is Poland’s national church and has served as both the coronation site and burial site for Polish monarchs as well as for those of national importance. 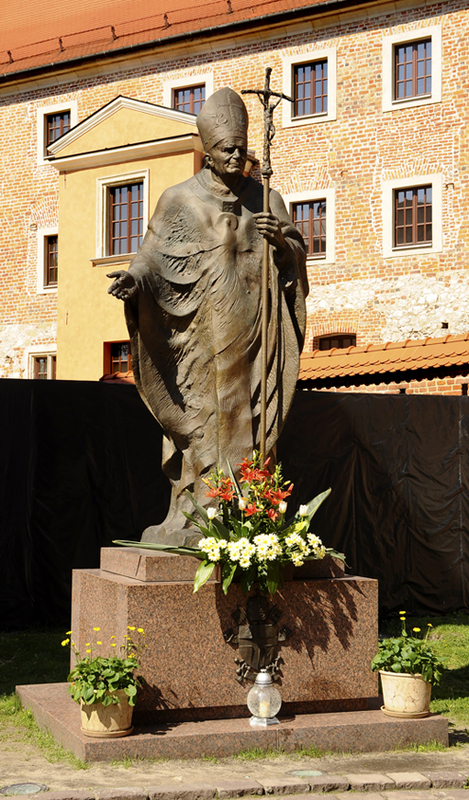 Pope John Paul II, the very first Polish Pope, said his first mass as a priest at the Cathedral in November 1946. 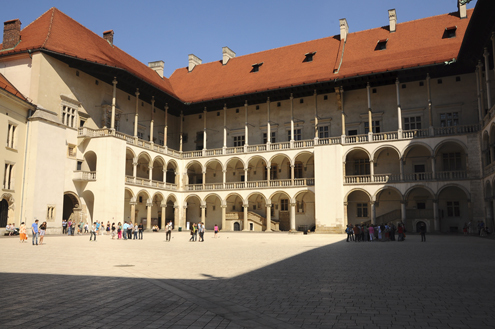 Wawel Castle, the Royal Residence of the past, offers visitors tours of the Royal Private Apartments and State Rooms along with access to other permanent exhibitions within the castle complex. until he was killed by a poor shoe-maker who stuffed a sheep (or was it a lamb?) with sulphur and left it for the dragon to eat. 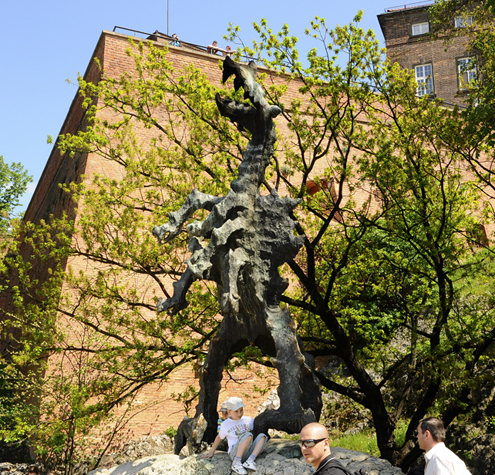 The dragon then developed an insatiable thirst and drank from the Vistula River until he burst. As a reward, he won the hand of the King’s only daughter. Way to go shoe-maker! 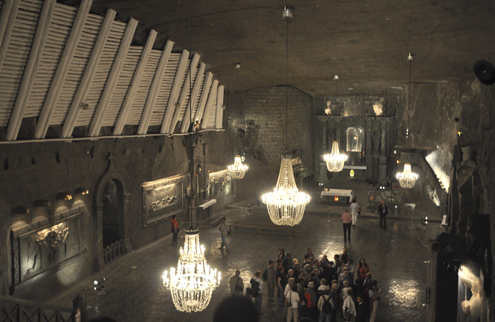 Apart from all the sights and folklore Krakow has to offer, we stepped outside the city center for two side-trips—one to the Wieliczka Salt Mine (featured below) and another to Auschwitz-Birkenau, the notorious concentration camps of WWII (featured in another post). 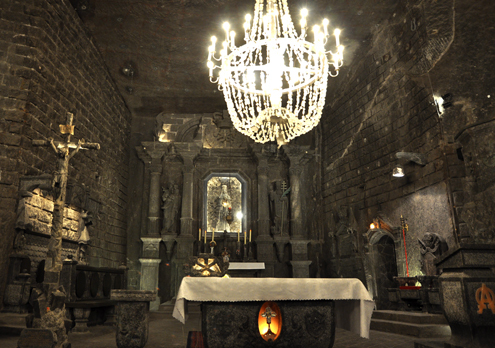 The Wieliczka Salt Mine, about 9 miles southeast of the city center, is one of the world’s oldest salt mines. 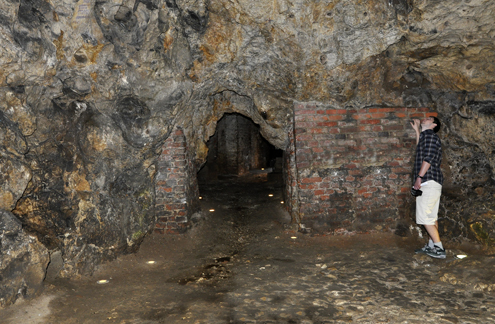 Table salt was mined here from the 13th century to the late 20th century. Today these massive mines offer visitors a look into the world of a salt miner as well as the opportunity to admire the many sculptures made from, you guessed it, salt. And that’s all from Kraków. We had a wonderful time visiting this beautiful city. Dziękuję! 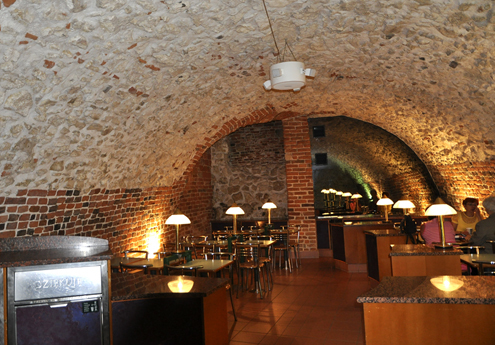 This entry was posted in Poland and tagged Krakow, photography, Poland, rynek glowny, Salt Mine, travel, Wawel Hill. Bookmark the permalink. The first one is my favourite shot!!! All the pictures are great!!! Thanks, Chitra! Glad you enjoyed the photos. Krakow is my favourite city. What a place. Did you check out the Jewish quarter too? Very interesting. We did check out the Jewish quarter…another great area in Krakow. Just curious…how do you travel to these places? Do you take the “Chunnel” on a train, then travel by train to your destinations in Europe? Your blog is a delight to follow!! I feel like I’ve been there. Great photography, Margo. Thanks, Nancy! We usually fly, as we can get to most places in under two hours–that’s the beauty of living in London!